Sporophyte plants grow to 5-28 cm, and produce spores from June to August on the fertile spike. The small green plants may be hard to spot in longer grass. Unlike other ferns the fronds (leaves) do not uncoil spirally. The frond is made up of two parts. The shorted larger leaf blade is non-fertile and is pinnately divided into fan-like sections, of which there are 4-10 pairs. The longer fertile spike is narrow and taller and is irregularly branched. It emerges from the non-fertile frond and is covered in spores in late summer. There are only three species of ferns in the Ophioglossaceae family which occur in Ireland. Moonwort differs from the other two species (Adder’s tongue ferns) in that it has a pinnately dissected frond. Adder’s tongue fronds are entire and simple. Moonwort is a small fern which grows in well drained short grassy habitats on base-rich soils, open sunny places, heaths and dunes. Moonwort is widespread throughout Ireland but only in low numbers. It can be difficult to find, even at known sites. Both the perennial root of the sporophyte frond and the tiny gametophyte generation which lives deep in the soil associate with fungi species to survive. Plants die down at the end of summer and may not reappear for several years. Moonwort habitats are under threat of being lost due to land abandonment, changes of use, and agricultural improvement. 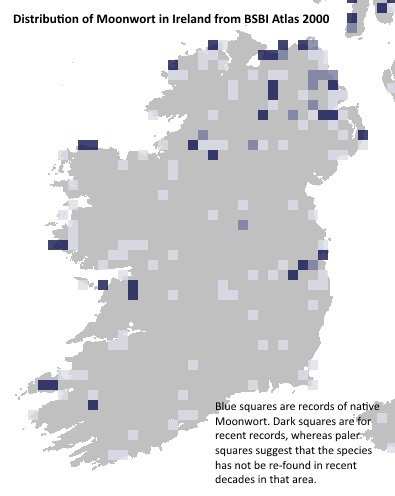 If you have seen Moonwort or any of the species in the Irish Species Project, please fill out a recording form. It can be downloaded here, and you can also download the guidance document for detailed instructions (both also available at http://www.bsbi.org.uk/ireland.html). Merryweather J. and Hill M. (1995). The fern guide: an introductory guide to the ferns, clubmosses, quillworts and horsetails of the British Isles. Shrewsbury: Field Studies Council (Great Britain) 2nd ed.